The Conservative leader says his party will "respect the decision of the courts." 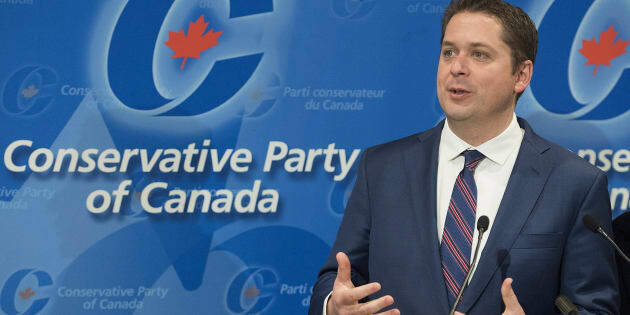 Conservative Leader Andrew Scheer speaks to reporters during a meeting of the General Council of the Conservative Party of Canada in Saint-Hyacinthe, Que., on May 13, 2018. SAINT-HYACINTHE, Que. — Conservative Leader Andrew Scheer said Sunday that he had spoken with MP Ted Falk, who made a controversial comment about abortion in the House of Commons, but did not confirm what he told the Manitoba politician. "I spoke to Mr. Falk, but I don't talk about internal management," he told reporters following a party meeting in Saint-Hyacinthe, Que. Scheer did not say whether Falk had been reprimanded for his comment. Falk caused a stir in question period on Wednesday when he responded to a statement by Prime Minister Justin Trudeau, who promised his government would always defend the right of women to have an abortion. In response, Falk yelled out: "It's not a right!" Scheer, who has said he's personally against abortion, did not answer a question about how he reacted to Falk's comments, nor would he say whether he personally believed abortion to be a right. Without ever using the word "abortion," he repeated multiple times that a Conservative government would "respect the decision of the courts" on the matter. Scheer had not previously responded to Falk's comment, which was denounced by many opposition MPs. Several Quebec Conservative MPs also spoke out against Falk, including Alain Rayes, Gerard Deltell and Sylvie Boucher. At the weekend party meeting, several Conservatives distanced themselves from Falk's comments and said they did not reflect the party's values. "That was his own opinion, and it doesn't reflect the party and the ideologies of party members," said Valerie Assouline, a member of the party's national executive in Quebec. "It's certain that I find it unfortunate, that he made that comment, and I don't support the comment," she said. Party member Jean-Philippe Fournier, from Montreal, said it was a "false debate, because it's in no way in our plans to open that," he said. Anne DeBlois, a party member from the Quebec City area, worried the fallout could have an impact on the party's image in Quebec. "For me it caused some discomfort, and I know there are some who won't like us because of that," she said. "I'm aware of that, but there are people who don't like Justin Trudeau for other reasons," she said.